Not happy with myself much tonight, Bowled in my first collegiate match today. The pattern was Cheetah one of my all time favorites fits my style very well. Been averaging 220 all week in practice on it, but not the case today averaged 185 Byte was jumpy coming off the oil leaving splits and corners, Hy-road was flat leaving me washouts on occasions. On reflection should have switched to Zero gravity and moved deeper and opened them up. I was surprised I didnt get sat, but coach said he has confidence in me and sometimes it takes a rough outing to get a good roll going. I hope he is right. 16 bakers tomorrow and as of today I am either setup or anchor. Going back in to the lanes tonight and work on spares. Will update tomorrow. Looks like you have a good coach. Good Luck today Jr. Thanks Boss, but bad news. Went back in and was practicing spares something was on the aproach I stuck and fell and jammed my ring finger swollen so bad cant get my finger in my ball had to pull myself. So frustrated right now! Ouch, Jordan! Hope you can get back on that horse soon, so to speak. 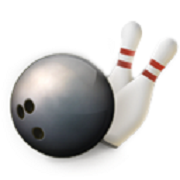 Thanks, all I am back on the lanes as of last night. At our practice Monday night coach let me work with the other bowlers to help get them a better spare system for themselves and I seen some progress last night with the ones I helped. Last night we were practicing on Chameleon we only rolled one complete game and I found myself looking for a solid line to play. I never did find it shot 194 but the score looks better then the actual game itself. Generated in 0.016 seconds in which 0.002 seconds were spent on a total of 14 queries. Zlib compression enabled.